Hi, my name is Lil and I'm addicted to salad. Even as a kid, I loved salad and in particular creating new and delicious salad dressings! Recently, this particular salad has been the objection of my obsession. Tasty, easy to make and a meal you can feel good about eating. Add some lean protein if you like, but I prefer it vegan - the quinoa and chickpeas pack in all the protein you need for a complete meal. 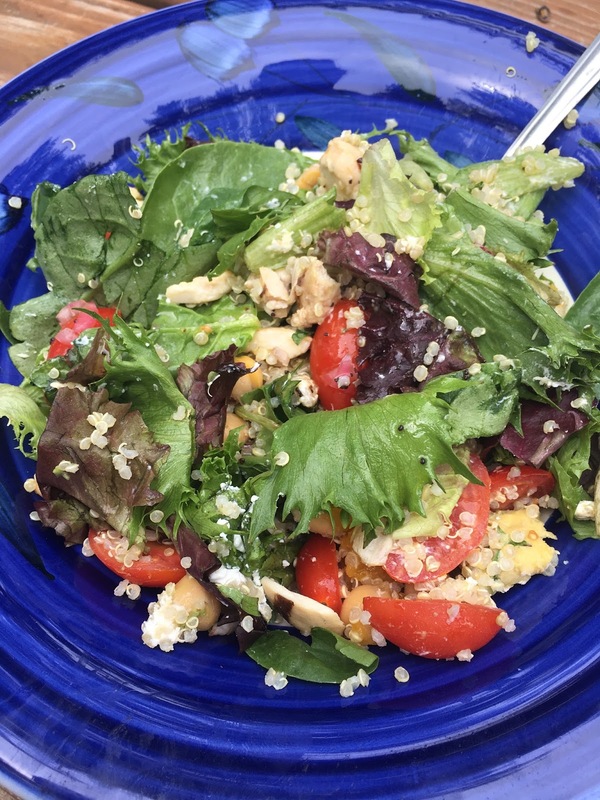 I'm on Week 2 of 21 Day Fix Extreme (you can follow my journey here) and this salad has been a staple, not only for myself - but my awesome neighbor is just as obsessed. We eat dinner together with our kiddos twice a week and we've made it almost every time, lol! Did I mention we are obsessed??? Neither of us was too keen on the blueberries, so first we went sans fruit - but hellloooo, mango!!! Perfection! Speaking of obsessed - anyone else out there on Snapchat??? I have to admit I was skeptical, but honestly - its so much fun and amazing way to connect and really get to know each other - if you're on there, hit me up @liliaslewis and I'll follow you back! 1. Mix all ingredients for dressing in an empty jar or small bowl, shake or whisk until combined. 2. Place salad mix in large serving bowl. 3. 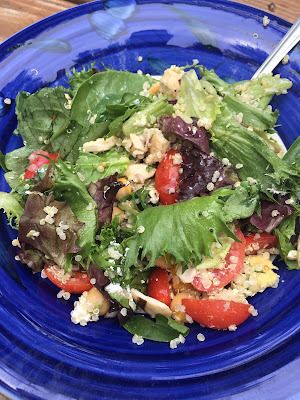 Layer quinoa, tomatoes, avocado, mango, goat cheese, chickpeas, and sunflower seeds. 4. If serving a large crowd, mix dressing immediately in serving bowl before serving. Otherwise, dress each bowl individually and save remaining dressing in fridge up to 5 days. Would you love more recipes like this? Want to connect and get started on YOUR journey with the support of other like-minded women?! Connecting is easy - simply complete the application below!